It’s all new Nostalgia Critic videos, from reviews to origin stories to deleted footage! 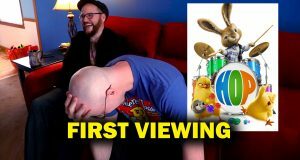 The time has come to see the Nostalgia Critic embarrass himself as well as others as he takes on Night of the Living Dead, the Cinema Snob Movie, the Review Must Go On, and his OWN home movies (yes, the ones Mara Wilson embarrassed him with). Plus, a look at the story behind one of his most popular characters Santa Christ! Witness his sugary past and more in this brand new collection of hilarious insanity (Hilanity as we like to call it). Check out Nostalgia Critic – The Awesoming today. Preorder on Vimeo on Demand now via the video or this direct link! Set to launch on October 13th,2015. Anyone who orders this and wants the DVD keep your purchase email from Vimeo, and you’ll get $7.50 off the DVD (with more content) which is set to be sold early 2016! DVD will be priced at $15.00 (this will end up costing people who purchased the Vimeo bundle only $7.50 + shipping) and will have some extra new content as well as some older stuff. Ah, but can we get the script for Rachel’s farewell that accidentally got deleted? It’s been how long and I still want that? I own every single DVD from the store, so SOLD! I know that was just a second of it, but it kinda seemed like Papa Walker was disturbingly good at impersonating Rachel. What’s his name, Barney? I could go for him playing Hyper Fan Girl at least once. Sounds like this would be cool. But are you Doug gonna post the nc’s onto Vimeo since screenwave as a backup? The origin of Santa Christ?………..YEEEEEEEEEEEEEEEEEEEEEEEEEEEEEEEESSSSSSSSSSSSSSSSSSSSSSSS!!!!!!!!!!!!!!!!!!!!!!! OMG!!! THE ORIGIN OF SANTA CHRIST! He´s my favorite NC character! he’s ALWAYS done it, for a while. I think he means that the content itself is only exclusive for a while. I bought the first few DVDs but won’t be buying this as I know the reviews are pretty much all I’m interested in seeing and they’ll be uploaded to Channel Awesome’s Youtube channel in about a year. Not that I don’t want to support the site, just that I don’t see the point in paying for something I’ll watch once or twice then find it’s online soon afterwards. Especially as I have to pay international shipping for it. Still, don’t complain about them charging for stuff, it’s how they keep the site running at a high standard and mostly ad-free aside from the videos. Don’t forget Doug gave up a pretty lucrative job for this so I think he’s entitled to expect a few spoils, and people are willing to keep paying them. Was I wrong in saying what I said? For a website that is founded upon reviewing/critiquing, Channel Awesome seems like it can’t take much criticism for it’s own content. 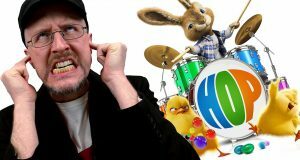 I don’t know if any of you have seen/heard of Doug Walker (A.K.A The Nostalgia Critic) and his website thatguywiththeglasses.com (now changed to channelawesome.com). 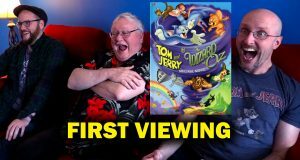 Doug Walker’s show reviews old television shows, movies, games, etc. But he did it in a way that was comical and brought to life other characters, like Chester A. Bum and Askthatguywiththeglasses. It was, at least to me, funny. Wow, short video. This still looks good, though. Are your videos on Vimeo now? The review of those home videos sold me. I will order the DVD when it comes out, all this newfangled video on demand goes beyond my humble intermanet skills.